Many industrial water filtration situations involve the release of water, which may contain VOC’s or other contaminants. Without treatment, these impurities may cause environmental damage or contamination. Industrial activated carbon filtration is an effective method of dealing with organic contaminants in water. 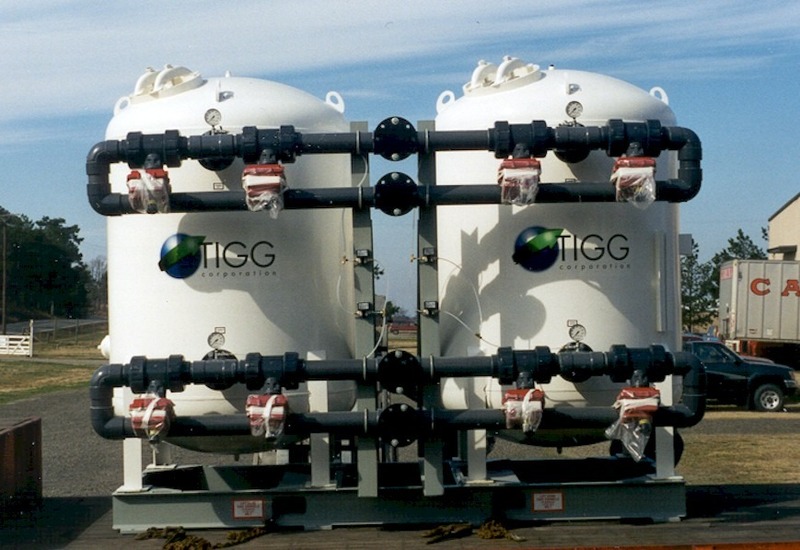 TIGG’s liquid phase activated carbon filter, or adsorber, with granular activated carbon can treat the water, separate solids and waste, and remove contaminants, thereby returning safe, remediated water back into the environment. TIGG fabricates a wide variety of industrial activated carbon filtration products from activated carbon adsorption equipment to granular activated carbon media to rentals and systems for treating most any size filtration project. Suspended solids can be effectively removed by industrial activated carbon filters, multi-media filters, or filters containing special zeolites. TIGG provides the industrial water filters, piping, valves, and controls, for these applications. An Industrial plant needed water filtration to remove particulates prior to the process water going to a carbon adsorption system. TIGG provided two 5′ diameter 100 psig ASME Code, skid mounted, pre-piped multi-media filters. The water filtration and back washing operations were automatically controlled via a programmable logic controller. Back washing was initiated when a preset differential pressure was detected.